Right now is the perfect time to start planning for next year! Contact me today to build that perfect package for Carnival 2020. There are some incredibly unique opportunities out there and with a whole year to plan (and make payments! ), you're sure to get prime reservations in the heart of Venice. 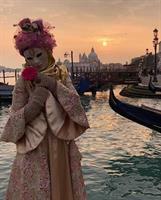 Contact me TODAY and let's get you to Venice next February. And don't forget to follow me on facebook. My group page, Calluna Travel - Offers and Opportunities, is the place to find more of these incredibly unique deals and last minute flash sales.